The burnt wreckage of the BMW following the crash at the SILK Highway on Tuesday. Earlier reports had stated that two people were burnt to death in the accident. 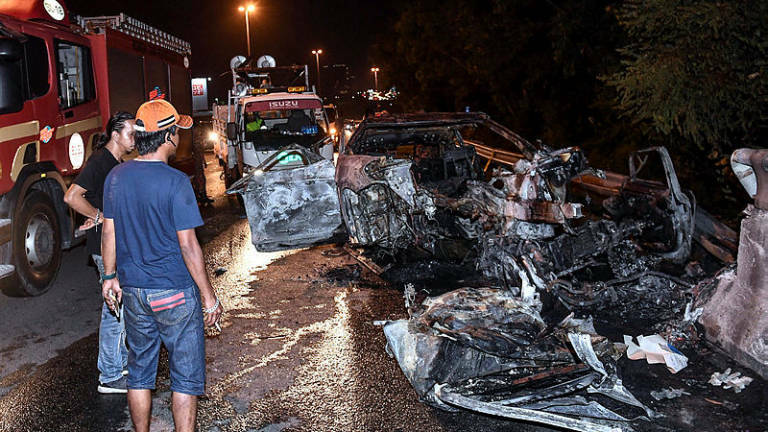 According to Selangor Fire and Rescue Department Assistant-Director (Operations) Norizham Mohd Nudin, the fire destroyed 90% of the vehicle. "The car was heading towards Sungai Long when it skidded and smashed into the centre divider," the Star Online reported Kajang OCPD Assistant Commissioner Ahmad Dzaffir Mohd Yussof as saying. "All three victims in the car were trapped in the vehicle when it burst into flames." 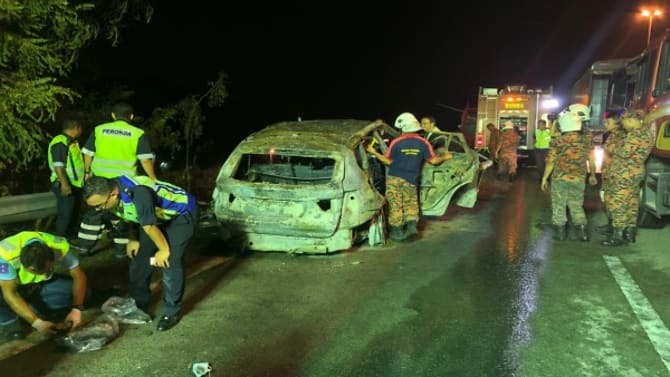 After a team from the Fire and Rescue Department extricated the bodies from the car, they were sent to the Serdang Hospital Forensic Department for an autopsy. According to ACP Ahmad Dzaffir, the victims' deoxyribonucleic acid (DNA) sample is being obtained to ascertain their identity, reported Bernama. Meanwhile, the BMW had been towed to the Kajang District Traffic Police Headquarters for inspection of its chassis number and by Puspakom.